Keep Your Company's Restrooms Clean! | Ace Uniform Services, Inc.
Clean restrooms help drive positive customer opinion and are good for your bottom line! Companies engaged in the business of customer service need to keep their customers happy to grow their business. Uniforms are a great way to increase customer satisfaction, and one of the other services we offer can really help your customers come back. Clean restrooms are essential for your customer’s happiness and your business’s reputation! A customer’s view of a business can be impacted positively or negatively by whether the bathrooms are clean. This is particularly important for restaurants – a dirty bathroom may lead a customer to think that the kitchen is dirty too. In fact, studies have shown that as much as 86% of American adults make this correlation and that as many as 75% would not come back if they came across a dirty restroom at a restaurant! The focus shifts from your company and what it offers to the image it projects through its bathroom. You want to keep your reputation squeaky clean because your customers will keep coming back! Your customers are smart, and can form impressions about your entire company operations by looking at your bathrooms. Service industries and restaurants, in particular, are at risk of negatively impacting their business and their bottom lines by neglecting this important area. Clean restrooms encourage your customers to trust your level of service. Customers, by forming a positive opinion in this way, may be less likely to scrutinize your services or even argue about service charges. Maintaining clean facilities is essential in the modern age. Business owners know that a connected customer base can put a lot of pressure on them to deliver quality service. One negative review on a blog or a site like Yelp or Facebook can discourage customer growth! Having clean bathrooms demonstrates your dedication to all facets of customer service. By showing this dedication, you can encourage positive reviews which help your business thrive and grow. In the restaurant industry especially, customers who feel confident using your restrooms will stick around longer, bringing more revenue for your business. 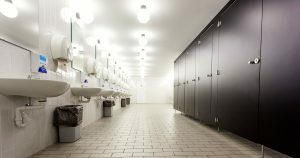 Having clean restrooms is great for your bottom line! When searching for pillows, you will find that there are so many styles to choose from that you may get overwhelmed. Pillow styles range anywhere from body pillows, neck pillows and even sleep disorder pillows that help with sleep disorders like sleep apnea. Look at Best Stomach Sleeper Pillow Reviews – if you like to sleep on your stomach and can’t think of changing your sleeping posture, we have reviewed some of the best pillow. Unlike side and back sleepers who use plump pillows for pleasure, stomach sleepers need a pillow with an optimal profile. To give your restaurant or business a clean, professional, and cohesive look, rely on Ace Uniform. Whether you need a clean bathroom service, or uniforms in the food, automotive, industrial, construction, medical, security, or you-name-it industry, we can provide you with the service and uniforms you need for the price you want. Give us a call at 1-800-366-1616 or visit us online to learn how we can help meet your needs. Want to get to know us even better? Visit us on social media on Facebook, Pinterest, Twitter, LinkedIn, and Google+. This entry was posted on Wednesday, September 14th, 2016	at 1:09 pm	. You can follow any responses to this entry through the RSS 2.0	feed. Both comments and pings are currently closed.